Fossil fuel use is causing runaway global climate change, threatening people, cities and ecosystems. But we still have time to reverse course if the world can transition to renewable sources for almost all energy purposes. California has the most ambitious climate policy framework in the world, and the San Francisco Bay Area has the resources, political temperament and innovative spirit to demonstrate how to eliminate fossil fuel use. This means ending our dependence on petroleum and natural gas and powering our buildings and transportation system with renewables like solar and wind. We can prototype ways to become fossil-free, modeling them for cities and urban regions around the world. 1. Consume less fossil fuel by eliminating unnecessary energy waste and improving energy efficiency of our buildings, land use and transportation. 2. Electrify most energy uses, to convert buildings and vehicles that currently burn natural gas or gasoline to instead use the electricity grid. 3. Decarbonize the electricity grid by replacing fossil fuel uses and meeting almost all energy needs with 100 percent renewable sources like wind and solar. 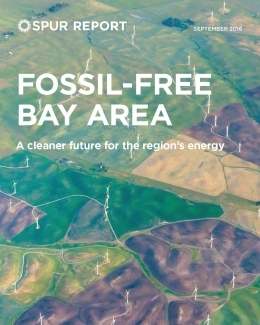 This framework of actions — reduce, electrify, decarbonize — will allow the Bay Area to significantly reduce fossil fuel use, reduce our contributions to climate change, improve our climate resilience and demonstrate a model of urban sustainability that can be applied around the world.